Catch the breeze and magnificent open water front views from every room of this 3 bedroom, 2 bath river water-front gem on the Saint Martins River. Decorated with vintage cottage furniture, red oak floors, comfy Macy's beds, Handcock & Moore leather sofa/club chair, leather & dense foam PB ottoman, and Sony sound entertainment system. A screened porch invites you outdoors. Also enjoy spectacular sunsets or sunrise from the roomy sundeck or our private dock. Visit the Ocean Pines Beach Club 10 minutes drive to the beach in Ocean City, MD. Launch your boat, crab or fish from our private dock (MD fishing permit not required). The cottage includes two Sony HDTVs and DVD players with family movie cable package, but no landline. Bed sizes: 2 Queen size beds, a Full-Over-Full Bunk Bed, and a Full Sleeper Sofa bed with memory foam mattress (new). We are fun loving people who like the very best. We enjoy traveling, sailing, kayaking, star gazing, bicycling, tennis, taking walks, and collecting art and antiques. Beautiful and peaceful waterfront settings with sunrise and sunsets on large water views are our favorite places and we enjoy hosting a guest cottage to families on summer vacation who wish to share that experience. The variety of great eating (barbeque, crab, fish and seafood, etc.) in Ocean City, along with a good wine or beer after a day at the shore, adds to one's relaxation while sinking into a deep leather sofa and listening to favorite high fidelity music, or watching favorite movies, or simply enjoying a board game. Location, location, location. Sunrise year-round from the large waterfront deck. Sunrise and Sunsets in July. New marine stainless steel railings open up large panoramic water-front views. My parents were among the first to build a cottage along this shoreline 40 years ago and I have enjoyed sailing this tidal river/bay and nearby marshes ever since. Coastal Cottage offers a unique combination of nostalgic Summer of '42 cottage charm with its classic screened porch and huge 32 x 10 foot sundeck directly on the water. The one-floor elevation adds drama to viewing the exciting panorama of nature that envelops this waterfront getaway and the many improvements have made the cottage pin-drop quiet and serenely relaxing inside. Enjoy the sunshine and surf in Ocean City at the block long beach front Ocean Pines Ocean Club with courtesy parking pass and swim passes for 4 guests. Central Air An high energy efficiency rated HVAC installed in the last few years, combined with storm rated windows (added 2018) and extra insulation maintains comfortable even temperature. For 4 cars in driveway plus additional street parking. Visitor parking pass for Ocean Pines Beach Club is complimentary with summer bookings. Two TVs -- a Sony Bravia HDTV with blue ray DVD player in LR/DR area connected to a Sony sound system. A second Sony HDTV is located in rear bedroom. Living areas are all on the second floor with access to a large sundeck and screened porch with sweeping open waterfront views from every room. He house was well taken care of and very clean and the kitchen well stocked, and dining room exceedingly comfortable. . The setting with the river behind was gorgeous, and the owner obviously takes pride in the property. 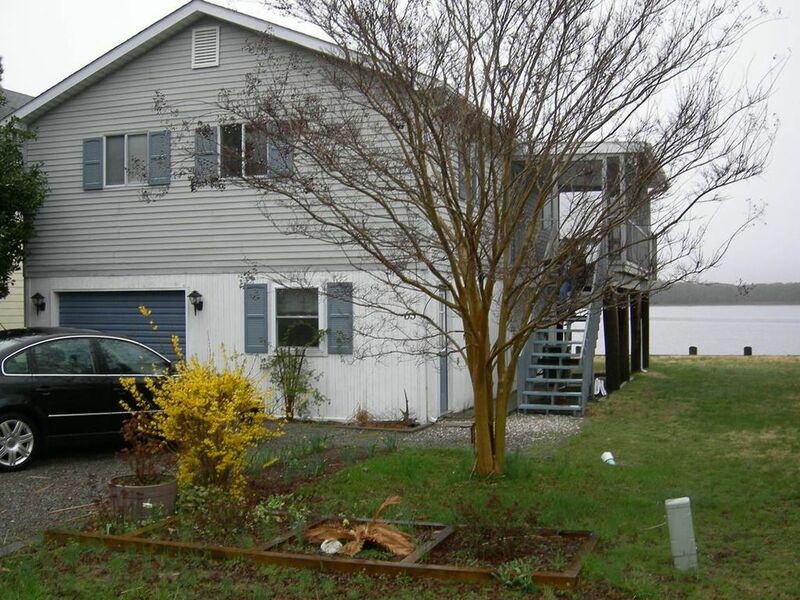 The location is perfect, about 15 minutes to Assateague, 10 from OC BW, and close to great restaurants. I'd highly recommend the property to a single, couple or family. Wonderful guests. I wish all were like them and hope they'll return to Coastal Cottage in the future. Waterfront in a nice quiet area, even for Labor Day weekend. Great community, plenty of streets for walking around, and close to restaurants. Great seafood if you like to cook with Crab shack offerring a variety of seafood, including prepared options. House was clean and met my needs. Large deck and a screened porch at the side that protected from direct morning sun. Happy to hear that our guests enjoyed their visit to our water front cottage and enjoyed the local seafood offerings and took advantage of the tranquil scenery in walks along nearby streets. We hope they will make Coastal Cottage their destination for a future vacation. We loved the home. Conveniently located close to the boardwalk and stores. We enjoyed going out on our family boat right off the dock of the house. We also were able to catch crabs everyday. We can’t wait to come back again! Nice clean and well appointed cottage on the water. Crab pots provided. We enjoyed relaxing on the large deck and eating crabs. Brian and his family were wonderful guests to host at our waterfront home. I am pleased that they enjoyed catching crabs at our dock and hope they will return for future vacations. Coastal Cottage is more than just a place to stay near the Ocean. It is a destination set in a serene natural setting with beautiful water views and an abundance of shops, restaurants, and activities along the Atlantic coast. We had a great time at Coastal Cottage . Coffee on the covered side porch in the morning and drank wine to watch the beautiful sunsets on the riverfront porch. The cottage had just the perfect amount of space and amenities for our family. We crabbed , kayaked off the pier , played yard games , had dinner on the outside porch , played chess and watched movies that all game with the cottage . The bedrooms were clean with lots of blankets and comfortable beds . We went to beach almost everyday and never even used the pool pass that came with the cottage . On the 1 rainy day we had, we watched movies and enjoyed the water view from the dining room tables while playing cards . Using the crab pots that came with cottage was really fun! We had a crab feast one evening using the steamer that was also provided . The coastal cottage has everything you could possibly need . I appreciate hearing back from guests about what makes their vacation at my waterfront cottage special and enjoyable. Marcy and her family were delightful and considerate guests and I hope they will choose Coastal Cottage for their getaway destination at the beach for years to come. Great couples or family vaction spot. This is a perfect place for couples or a family to spend time together enjoying the Maryland Shore. The huge deck and screened-in porch provide a great view of the river plus with the weather we had, we ate every lunch and dinner at the big table out on the deck. The kitchen was well-equipped and there was a Food Lion grocery store a short distance away, so cooking was easy. The house is located on a quiet, low traffic street, but is still convenient to everything. The Ocean Pines Community has many great facilities and the Private Beach Club is only a 15 minute drive away. The Club provides free parking, beach access, pool, food and beverages bars. Since we brought our boat, it was great having the dock in the back yard. It was just a short ride to the bay where we fished every day. Our son also used the available crab traps and during the week caught 6 crabs. There's nothing better than fresh streamed crabs! Leo was very responsive when we had questions and provided a clean, well-equipped vacation rental home that we would highly recommend. Brian and his family were great guests. They left Coastal Cottage clean and tidy and treated our home like it was their own. I greatly appreciated our correspondence. Brian also shares our love of the water -- boating, fishing, crabbing and the awesome views. Like us, this family learned that our waterfront home is not just a place to stay while going to the ocean and doing other things -- it is the destination itself. While I enjoy walking along the Atlantic coast from time-to-time I am also content to just spend time away on the relaxing screen porch, sun deck and open living and dining rooms taking in the beautiful and tranquil environs from the cottage. I hope that Brian and his family will choose to return to Coastal Cottage for future vacations. They will be most welcome. We are fun loving workaholics who like the very best. We enjoy traveling, sailing, kayaking, star gazing, bicycling, tennis, taking walks, and collecting art and antiques. Beautiful and peaceful waterfront settings with sunrise and sunsets on large water views are our favorite places and we enjoy hosting a guest cottage to families on summer vacation who wish to share that experience. The variety of great eating (barbeque, crab, fish and seafood, etc.) in Ocean City, along with a good wine or beer after a day at the shore, adds to one's relaxation while sinking into a deep leather sofa and listening to favorite high fidelity music, or watching favorite movies, or simply enjoying a board game.